Emily Catherine Illustration: April May Blogger Logs! Working away at MudFest. Photo by Tom Errington. Welcome to the bogger log! I hope you have all been well, healthy, busy and enjoying the crisp sunshine (and miserable grey days, why Nottz?) This one's a bit of a cross-month blog on account of all the events being at the end of the month and not really knowing how to shout out effectively. You know I love a shout out! On their launch they decided to help raise money for a worthy cause, Dave 'Cockleman' Bartram's cancer treatment. Dave's the last Cockleman in the countreh, and he has been a loyal servant to the city for over 56 years selling cockles, mussels, crabsticks and the like to hungry patrons from his little mobile basket. Recently, Dave was attacked and mugged of his earnings, leaving his ribs badly damaged. On a hospital check up of his ribs, the doctors discovered he had cancer. Dave now faces being out of work for two months and we are raising money for his loss of earnings. The thing about Dave is this, he isn't just a lovely chap that sells fish, he's a Nottinghamshire institution and the fondness of his very being here represents how weird and wonderful our little Notts quirks are in this city. We celebrate our individuality and our traditions, however strange they may appear to other folk. Dave is appreciated for all that he has done and forms our cultural identity more than we have previously acknowledged. Dave 'Cockleman' Bartram at Nottsman Launch held at the Old Angel Microbrewery. Photo credit Tom Errington. Next up I hot-footed it to the New Art Exchange for Real Creative Futures showcase and launch. Obviously, I could spend all day telling you all about how Real Creative Futures helped me have the confidence to start my own business, but I'll spare you because I've been rabbiting on a lot about it! In a nutshell, Real Creative Futures is a mentoring and coaching course, which is free, funded by the European Union, Arts Council and Nottingham City Council which supports and funds Creative Businesses regardless of age, race or financial situation. It can help anyone who wants to start a business, start a business. It offers tailored advice for those wanting to grow their business and there is no catch. The reason why it exists is because of a long term lack of funding in the creative industries which has meant that our economies, whether local or national have suffered as a result. The ethic is, if we invest in people who have diverse creative business ideas, and help them flourish, they'll become the next employers, patrons and experts in business and the arts. As a 'graduate' of the programme, I was invited to have a stall at the showcase event. Speakers who had been on the programme and become business owners themselves spoke about their different experiences and practices and new sign-ups performed, and well know artists painted. It was an incredible sight to see everybody interested and involved. Bea and Laura take a selfie! Spot the mini gallery of mine to the left! :). Photo Credit Bea Udeh. Chris's choice for 365.... Photo by Chris Underwood Faceiro. My choice for Social Media. Photo by Chris Underwood Faceiro. Me thinking about how many biscuits I could eat....Photo by Chris Underwood Faceiro. Me after Chris and I had just had a humerous discussion about Combi Boilers. Photo by Chris Underwood Faceiro. A photograph NOT taken by Chris Underwood. See? It really does make a huge difference... Photo taken by Emily Catherine. Next up! Mudfest. Oh Mudfest, what can I say? On Friday April 28th Georgina Wilding the founding editor of Mud Press launched her new anthology of poems called WOMAN which, I was priviledged enough to design the cover for, and contribute to the accompanying 'zine. After Nottingham recently became the UNESCO city of literature, and Nottingham poetry festival got underway, Mud Press had been asked to contribute to events and boy, did they. Georgina decided to have a poetry Glastonbury!! A mini festival of all things in keeping with the spirit of Mud Press; Dancing, Facepainting, Confetti, Balloons, Music, Live Art, Poetry, Spoken Word, Poetry kissing booth, Lucky dip illustrators, market stalls, drinks and photography filled the little courtyard of Cobden Chambers with mirth and revelry for a few hours. It was a remarkable success and a credit to Nottingham Poetry Festival. Apart from helping set up and chewing my hair in trepidation, I did some illustration to request for the event, something I have never done, and I learned a lot! All of my watercolour pens were useless. My style, as you know, is highly detailed but that's not appropriate for an event like this! So after the first couple of illos, I threw my ego away and doodled rough styles for my public requirements! It taught me a great deal about live drawing. I'll be saving my tips for future events and plan a lot more for disaster! Honey Williams live paint @Mudfest. Photo by Tom Errington. Kelsey Bryan (goddamn_i_am) live paint @Mudfest. Photo by Tom Errington. Finally we had The Syndicate Marketplace at Surface Gallery curated and hosted by the quite brilliant Garrett Hansen. The Syndicate Marketplace was a pop up market of collectible, rare, used, vintage Urban and streetwear brands and footwear, new urban brands, art, music and drinks. It was a complete success made super especially brilliant by Garrett himself, who was the perfect host and showed real vision. The brands he got, the stallholders, music and atmosphere was absolutely perfect. Watch out for the next one because this will probably become one of Nottingham's most popular events! What's next? Well now coming up in my diary I have wonderful and exciting news! Then on Monday 8th we have a deliciously high quality bunch of badasses Juga-Naut, Vandal Savage, Stickman, Jonzi D, El Dia, Jourdan Pierre Blair, DJ Dan Rattomatic with Third Stage Wordsmiths; a opening celebration of talented spoken word and Hip Hop by local and international talent. 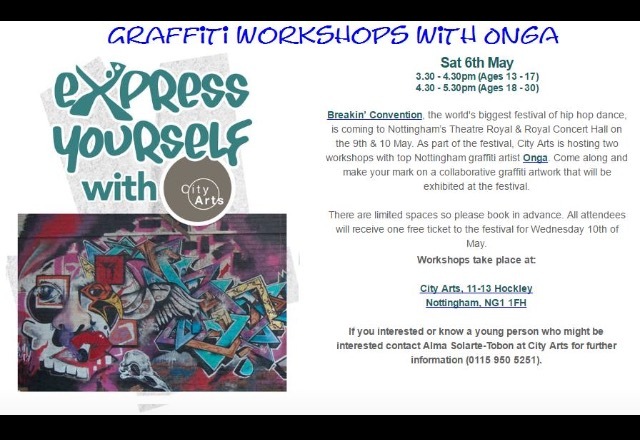 Then, as part of the main event there will be a FEAST of amazing things happening in the foyer to celebrate the Breakin Convention with a pop up exhibition with none other than the Anti Gallery, exhibiting choice artists (including myself) and running amazing workshops for the crafty amongst you. Check ma flavoursome poster here! Please come and support us! The Anti Gallery and all us creatives have put a lot into Breakin' Convention coming to Nottingham. We want to make it a really enjoyable event in our city! Now this is very exciting. Brand new, challenging and heartachingly satisfying. I will be participating in Pint Of Science Festival as an artist with Creative Reactions; a scientist/artist collaboration. Sounds boring? I thought so too initially, but no! I have been paired with a scientist who is using microscopy to study cilia (cells) to mutate them ultimately to help find a cure for serious diseases. This all sounded way above my concentration span. But when I met with my scientist, Becky Perrin, the way she explained it in laymans terms and the images she showed me were crazy exciting. Her research could help cure cancer. So, I have painted an epic and quite intense painting of a cilia. The Pint Of Science festival runs from the 15th-17th May 2017 at varying venues around Nottingham. Please come and show your support and have a party with me! Here's a picture of the final piece, unveiled as an exclusive to you! Cilia Black; Surprise, Surprise by Emily Catherine inspired by Rebecca Perrin's research on Cilia using microscopy for Pint of Science and Creative Reactions. Finally I am extremely happy and proud as punch to announce that I have a pop up shop at this year's Dot To Dot Festival! Sunday 28th May from 11.00am until 4.00am Monday morning!!! Dot To Dot festival is always fondly acknowledged and welcomed into our city and this little indie day festival offers big name headliners and up and coming stars around participating venues within the city. I will have a stall outside Rock City on Talbot Street selling prints, cards, tote bags and the usual! And lastly, bloody ell, this blog has been exhausting, if you're still reading, you deserve a Blue Peter badge for being bovvd. Treehouse HQ over and out! Happy New Year you boggers! I hope everybody had an amazing Christmas and New Year and you all are ready for 2016 in good health. As we fast approach February, Treehouse HQ has been a hive of activity! Prints, cards, events, fun and commissions! Firstly, I have fantabulous new set of Celebrity Risograph prints, similar to my Paloma Yourself Together and Have Faith in style, of 5 celebrities which will be released throughout the year and are top secret! The brilliant boys at Dizzy Ink (https://m.facebook.com>dizzyink) have been working hard (sometimes against my tide) to help me get these to fruition. Tim Kloed and Emily Catherine Accidental Collab .... Purple Raining Geo Prints? Ha! You can follow Tim on Instagram under the name 'Timkloed' or contact him on tim-kloed.co.uk. Since our serendipitous print we are discussing a planned collaboration in the future, so watch this space. Dizzy Ink are having a party on February 3rd at the Lacehouse to launch their kickstarter campaign for new equipment. There'll be live screen-printing, drinks, and the amazing Jay Nurse AKA Jammi Nurk on the decks and I will be there smiling and drinking tea. The event is : https://www.facebook.com/events/1672504263021046/ -pop along and get krunk and krink with plenty of ink! Thank you to everyone who has bought the print, there is only one left on the website and three at Cavology. On a lighter note, February does bring with it the month of ...luuuurvvve. Which means Valentines Day is fast approaching. As some of you may know, I am not wholly celebratory of enforced celebration days, and I like to applaud the fringe minority at times of the year as these, which is why my Valentines Cards have so far been Anti-Valentines cards. However, if you're going to let someone know that you love them, I also have printed two of my Versace inspired fashion illustrations to cards and now have the perfect mix this Valentines Day. My cards are all £3.50 and printed onto high quality textured matt card, come with cellophane and an envelope and are blank inside for you to freely express yersen. Capriccio Dancers Card. £3.50 Emily Catherine lllustration. Gianni Heart Dress Card £3.50 Emily Catherine Illustration. Now for something different. February sees Nottingham celebrate the popular event, 'Light Night'. Get yoursens daan to Rough Trade Nottingham to watch the Revenge of Calculon and legendary Tim Onga paint with light (FOR REAL) or take a stroll to the Night Market in the Lace Market. The excellent independent publisher of poetry and illustration for the fringe of the city, Mud Press will be taking part with an excellent stall at the biggest night market event our city has ever had. On February 5th Mud Press have a stall at this https://www.facebook.com/events/1100429943302918/ with two anthologies, gifts and pretty lights. Please take time to visit her. She has a remarkable approach to poetry and has lovely red glasses to admire. Mud Press are asking for submissions from illustrators and poets to contribute to a 'zine they are curating called 'W O M A N' and I was honoured to be asked to create a flyer advertising it (see below). You can submit to www.mudpress.com. Also coming soon to February is The Anti Gallery's launch at Rough Trade, hosted by founder Saziso Phiri on the 12th from 7pm and is free entry (https://www.facebook.com/events/1732873540267462/). The Anti Gallery will be exhibiting 'Mighty Fine Art' a curated collection of Nottingham's finest. The Anti Gallery is pop up, visionary and dynamic and supports a wide range of artists to project a voice for all perhaps outside of the interior of the art world. For that reason you'll often find really unusual, ballsy and vibrant things. Don't miss the event! I'll be there, again, smiling and drinking tea! Sometime you boggers, I create things for my own personal satisfaction. For those of you who don't know, there is a grime artist called Big Narstie and he and Lordie (another Grime musician) have a Youtube channel called The Grime Report. As I was convalescing, feeling sorry for myself, the only thing that made me laugh was watching Narstie advise the BDL community on their problems. In honour of him, I drew him. I did contact he and Lordie and their agent to see whether I could make it into a card, as I was thinking of creating a Grime Series (Lazer Leng Character Print anyone? How good would THAT be?) However, no one got back to me, so I cannot use his image to make money without his permission. Instead, I will draw him and applaud him and love him to death. He is the happy buddha #Base, and when he laughs, I laugh. What a guy. Good looking out to February, the new year, new beginnings and new cakes.